I am pleased to be talking with Jennifer Brown today. 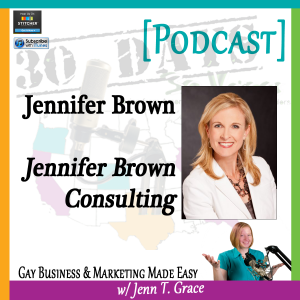 She is our first guest starting off the 30 Days, 30 Voices: Stories from America’s LGBT Business Leaders Podcast Project. You may remember Jen from an interview she did with us back in February, and because she had so much great wisdom to share then, I had to have her back here to kick off this special Pride Month series. So for those of you who do not know, Jen is the founder and CEO of Jennifer Brown Consulting which is New York City based consulting firm that is both a woman-owned business and an LGBT-certified business. She is a social entrepreneur committed to making an impact that creates healthier workplace cultures for all of the clients that she serves. Jen it is fabulous to have you back on the show, how are you? I’m great Jenn, thanks for having me. It’s fabulous to have you back and as I mentioned already, I gave the listeners a really little bit of an overview of who you are but why don’t you just tell us a little bit more about yourself and what your path looked like that led you to where you are today. Great, absolutely. I’d love to share. It’s been a wonderful journey and I’m really excited about what we’ve accomplished and really where we’re going. So I have had my company for about six years now, Jennifer Brown Consulting, or as we refer to it as JBC. And my background was a combination of non-profit management, I’ve always been pretty much of an activist if you can say, or an advocate for social change. And so I got my start in work like that and then at the same time I’ve always been an artist and performing artist and a vocalist. So I had two Masters degrees, one of which is in opera. And so in my twenties it was a combination of doing non-profit work, programming work for organizations that I believed in, and also singing and following the path of an artist. And that’s actually led me to New York which is where I live now, and I came here to do my operatic training and made a go of that career and ran into some trouble with my voice and so it turns out that I am prone to injury and had to have a couple surgeries. And out of that though, it turned really into a blessing because it led me to the work that I do now which is organizational development and consulting, because in fairness lots of things happened to lead to that. But there were a lot of aspects of being a performer that allowed me to be good at what I do now; whether it was improvisational ability or stage presence which translates into executive presence, creativity, resilience- certainly resilience because I was auditioning all the time as a performer. And so I was led to this career that I do now and it was just a total blessing in disguise the way that it all happened. And I didn’t always know I was going to be a business owner, or an entrepreneur. I had thought I would be an HR person when I originally started in this new field of OD and got a second Master’s degree in that discipline from Fordham. I thought I would be a learning and development or diversity professional internally in an organization or a company. And I did that for a while but through another series of serendipitous occurrences, including being led off and having to think about do I want to hang out my shingle or do I want to go back in house, I made the choice to stay outside. And that has truly made all the difference going it alone as independent, and that was maybe eight years ago I did that. And I stayed as an independent but I was a subcontractor in the work that we do, which means I was a consultant for hire, trainer for hire for a couple years and then one thing led to another and I discovered that I was feeling led by the business opportunities and client opportunities that I was having access to and decided that I needed to form my own company in order to really service those appropriately; and it started to get larger and more complex. So I started JBC six years ago as a company and behaving more like a CEO and less like a trainer consultant and hiring trainers and consultants and really working on the business of opposed to in the business. And ever since then we have grown, we’ve gained really interesting client lists, a lot of different typically large organizations that pay us to do what we do and all around organizational change where we still really get to be advocates for creating a more positive work environment, but we get to also bring our skills to bear in terms of whether that’s training or coaching or organizational design or strategy work. My own skillset of moderating, speaking and presenting, and of course consulting as well which was my original training. So we are rolling along, we’re growing, we’re I think having a broader and broader impact with every month that goes by and I really- the company is very mission-driven I think, and that’s I think what I come back to all the time is that growth, for growth’s sake’s, not really interesting to me as a business owner, but it’s more around impact and legacies that we leave. And also collaborating with great people and great partners, such as yourself Jenn. Wow so your path is a little bit of a zigzag, which I find to be the case with most entrepreneurs. Yeah, it’s interesting to see how you started off at point A, and getting to point B didn’t necessarily seem like it was clearly defined but you’re kind of listening to your gut and going with intuition on finding what that right path looks like for you, which is pretty cool. Yeah it’s been wonderful. I think you have to in life let things unfold, you can’t control them too much. And I think that the key is to really listen to where your guide is and follow your values of course, and don’t feel that you’re really constrained by anybody else’s agenda but your own. And I’ve tried to be in tune with that, and also opportunistic when I needed to be. And it’s just turned out really well that I happened to have the right skillsets to be running a company in this space today. You know in 2013. So I’m really grateful, I don’t know what the future holds but for now it’s working out very well. Excellent. So I typically like to start off the interviews with something more lighthearted, some sort of fun fact or something just maybe random about yourself that few people would know or expect from you. You know, I think I already kind of blew the surprise but usually I do share that I was an opera singer and people are always so surprised; I’m a very small, petite person. So they can’t believe that I can actually fill a room with my voice. But I usually do share that I sung at Carnegie Hall, and I’ve toured with some major orchestras all over the world, and I was a studio vocalist, I sang jingles when I was in that phase of my life and taught voice. So it was a really big part of my life and it really- I’m so busy now running a company that I don’t have much time for it but my probably drop everything to go sing with some sort of vocal jazz group like the Manhattan Transfer or something cheesy like that. That’s probably my fun fact, I don’t know if I’ll ever get that opportunity but JBC would definitely have to be put on hold if that came along. Yeah, you’ve got to put it out there. You never know; you never know who’s listening to this. So why don’t you share with us an ‘ah-ha’ moment, when you realized that this was what you were meant to be doing. And maybe it was a series of ‘ah-ha’ moments. Yeah. I think- you know coming into my own as an LGBT person, not just personally but professionally, when I realized that there is this massive community that’s very connected to each other, that’s very passionate about organizational change and really societal change. But a lot of my contacts happen to be in the organizational context. I think what I realized is that I could marry my consulting background and I think my humanistic view and altruistic view of leaving the world better than I found it. I could wrap this skillset and this passion around the work we do within the LGBT context, and really feel that my personal aspects were aligned with my professional value. And not only that, really fuel the professional value. And so I think that that has come to pass because so many- there’s so much momentum around LGBT workplace issues, whether it’s the work that the NGLCC has done in terms of creating supplier diversity opportunities, of which I’m a part and which I benefit from and which I continue to really support visibly; I think that has been a major- is it an ‘ah-ha’? It’s more that it’s an evolution and a tipping point. I think that’s been reached in the conversation about LGBT quality at work, and all the aspects that that means. And of course Out and Equal, just going now for ten years I’ve gone and seen the crowds of people and more and more allies coming to that conference, and more and more HR directors and executive leadership that are really coming for this issue and saying, ‘How can we get involved and this is the right thing to do. And we’re willing to lend a hand to it and our energy and our social capital and our relationship capital to make it happen.’ That’s been really affirming. Really, really affirming. So I think it’s a series of ‘ah-ha’ moments where you step back and you’re in the work so much you kind of step back and you realize that there’s this major movement happening around you and you happen to be right in the center of it. And you are able to be a change enabler through your skillsets, through your connections, through the narratives or things that you can share from the stage; and I think that’s where I really like to play is being able to crystallize all of this that’s going on in the moment and give it to audiences in a way that they can understand, that they find motivating and that they know how they can contribute to it. So it’s like every day is an ‘ah-ha’ moment. But I think also the ‘ah-ha’ moments on the flipside, not to be less than positive, but there’s still so much work to be done when we think about every time a friend of mine who works for a large company says, ‘I’m closeted at my job,’ it reminds me that we have not done a good job of creating inclusive, safe environments for all kinds of talent. And reminds me of the importance of the role that we can play as a consulting partner and I can play as a speaker and a role model to change that. And how we can influence our stakeholders, wherever they sit in the learning curve. Some are resistant, others are supportive but not active, or activated. And some are very activated and asking for more things to do and more responsibility and more accountability. So it’s again really an interesting challenge to look at the whole picture and then try to figure out the insertion points to create the maximum amount of change and impact and how I can participate in that. That is quite a personal mission of yours, and it’s great what your personal life, your work life and how all of that kind of comes together. And before I ask you the next question around inspiration, you mentioned a couple of things in your response that since you are the first interview of this series, people may not know at this point. So could you elaborate with maybe just one or two sentences on who the NGLCC is, who Out and Equal is, and what Supplier Diversity is. And I know all three of those could be very long answers. Sure, two sentences on each, okay. I’ll see if I can do that. The NGLCC is the National Gay and Lesbian Chamber of Commerce. And it is based in DC but it has a national network, and Jenn I believe you and I are certified LGBT-owned businesses meaning that the LGBT owner has operating control of the company and that that’s provable, et cetera. And it is a wonderful enabler for sales and business development and networking to have that have it on my business card and I have it on my website. And it means that we can be a part of the certified companies that our buyers are seeking. So Corporate America cares a lot about diversifying where they spend money with their vendors and their suppliers. And traditionally they’ve cared about women-owned and minority-owned businesses and getting more of those into the procurement process of the company. But the more recent activities and the founding of NGLCC and the growth of it has been around companies’ energy to get more LGBT certified and owned businesses into the supply space of a company. So we are part of that wave and it’s building; there’s still a lack of awareness I think, and understanding around, ‘Well why are we doing specific outreach with LGBT, we do women and minority, isn’t that enough?’ And obviously diversity looks a lot of different ways beyond what we say race and gender. And so the LGBT community and similarly the disabilities community which is creating their own- I think has already created their own certification for people with disabilities owned businesses, is following the same model. And so this is a really- it’s just a great movement that’s really going to bring a lot more innovation, a lot more new voices into the large companies that are looking for that innovation and looking for that diversity of thought. And also looking to support different diverse communities with their spend. You know and corporate spend can be very substantial so it can make a really big difference economically speaking. So that’s a purpose of the Chamber of Commerce, and then they have wonderful conferences and networks, I recommend everybody log onto their site. So that’s the NGLCC. And supplier diversity as a concept is what they’re about. Supplier diversity means just what I was talking about which is that every company- tons of large companies that have more maturity around this are seeking diverse suppliers of all kinds on a constant basis so that they can bring that diversity of thought into their companies, diversify their spend, demonstrate that they walk the talk through supporting diverse communities and the entrepreneurs in the communities. And they think it’s really good for the internal community of employees to see that the company is supporting the external community in this very tangible way. So it’s a win-win-win all the way around and that’s kind of supplier diversity in a nutshell. Your question about Out and Equal; Out and Equal is more of an educational I would say- an advocacy organization around and educating our arm around creating more inclusive workplaces for LGBT people. So it runs a massive conference every year in the fall, the Out and Equal Workplace Summit, and we’ve been presenting there for ten years like I said and there’s probably 3,000 people that gather at this conference and many, many, many companies send contingents of employees; both their LGBT people, their allies and their executives to come and have three days’ worth of workshops and presentations and keynotes about LGBT in the workplace. So it’s just a wonderful, again, learning mechanism, networking opportunity, presentation opportunity, you can submit workshops to highlight what you’re doing in your company, or you can simply attend and do a lot of listening and networking, and feeling really inspired that this community is organized and strategic and moving and has momentum is really changing the face of the workplace for large employers. And increasingly middle sized employers too, but traditionally it’s really started with the corporate angle. So they’re all great organizations that that’s www.outandequal.org for those of you that want to look it up and I would recommend getting involved in one or all of these and educating yourself about the opportunities that are out there. Thank you so much for elaborating on that because all three of those concepts and those two companies come up repeatedly throughout this series so I’m glad that you gave the listeners a foundation on that, and that’s fabulous, so thank you. So you are clearly motivated and inspired and you can hear the passion in your voice when you’re talking about what it is that you’re doing. So what does keep you inspired and motivated to continue doing the work that you’re doing every day? Yeah I think- boy it is so inspiring if you love change and you are social justice minded, how could you not be interested and passionate about this work? Because you are representing- you’re giving a voice to the voiceless, is how I heard somebody refer to it. And that for me as a singer who’s actually lost my voice and was deprived of that and had to pivot professionally, it’s a deeply personal connection between my history which was painful in terms of not really being able to have a performance career and then thinking about the role that I can play and in healing, I think, the healing people that are in workplaces that aren’t able to give their best for a variety of reasons that relate to their identity, as an LGBT person. Or frankly any kind of diverse talent, any talent that’s what we would call the non-majority population in the workplace. And so that motivates me. I think when you think about the business case of not- or the risk of not solving this in American companies particularly you can think about the impact of too competitiveness in the global markets. The ability of organizations to pivot and respond with credibility to business opportunities in new markets and resonate with their employees and be viewed as a transparent, ethical organization. You can also make the time that’s kind of energized as me, which is that if you are- if there’s something you can do about enabling every single person in your company to contribute not only their technical expertise but who they are to the company’s ability to be commercially successful. Those leaders that get that, and the companies that are dedicated to doing that are exciting to me because it’s going to be necessary. It’s going to be necessary to stay competitive, keep the competitive advantage to attract the best talent, to create the best products to be a good corporate citizen in the world. So I think that when you think about LGBT and how companies treat LGBT people internally, how they market to that community. Externally there’s a lot of choices that company leadership can make or not make, and then approaches that they can utilize and homework that they can do and market information they can understand or not, and transacting in this world, and being perceived as a brand that people want to come and work for in a constructive, positive, healthy workplace or not. So I am driven by- it’s bold but it’s nothing less than really economic competitiveness and viability of institution. It’s fascinating to me to think that we might hold the key- not all the keys but if we can understand what makes talent really tick, and what bonds people to the company that they work for; because let’s face it, not everyone is going to be an entrepreneur in life. A lot of people want to work for a company they believe in and they want to put down roots there and they want to stay there and make many years of contributions. How can we enable that dynamic to be the most healthy for both sides? We are not in an age anymore where companies get to call the shots all the time. Even in this tough economic environment, talent and the people in the organization, it really comes down to whether they want to stay, are they giving their best, do they talk about you to their communities, do they vouch for you in terms of encouraging people to buy from you and patronize your company. And really there’s nothing else. I mean social media has shown us that this is so important in terms of driving customers and business. So that opportunity to me feels like it’s a very central one to creating successful businesses and businesses that are good corporate- good business citizens and they raise the overall level of really our country and our world; because they’re so powerful. What they decide to do, how they do their business, how they treat the world’s resources is going to be more and more critical. So I think we all play a really important role, and we at JBC I think play an important role in affecting that and pushing it in the right direction. Wow. That is very, very high level and that is such a significant vision. It totally is. That is amazing. And I feel like you’ve covered so much in that one question, that’s insane. So I want to take us down to a- almost like a tactical level and ask you a question around marketing. So for people who are listening to this podcast, they may be business owners, they may be LGBT business, or they may just be allies who are in some sort of professional service where they’re trying to market or sell their product to the LGBT community. My question for you is for someone who is listening to this and they want to be successful in reaching out to the community in the right way; what would you advise them to do? What would a first step possibly look like? Yeah. I think that’s a great question. So you’re building a brand, right? You are trying to get people to trust you, know who you are, know what you’re about and ultimately support you, patronize you, et cetera. So brand building is all about relationships and trust and consistency, and alignment of values. So if you approach a community with these things in mind, and not just purely as a commercial argument, I think that you’ll get much farther. And I would say that the LGBG community particularly moves in a certain way and believes certain things, and you can read all the demographic information about the spending habits and what’s important to the community. Anecdotally as a member of this community and from what I know, I think the important drivers are for example, do you support the community organizations that we support? Are you somewhere on the radar screen in terms of charitable giving and alignment with certain advocacy organizations and issues; whether it’s LGBT youth issues like GLSEN does or it’s a workplace issue that Out and Equal supports, whether it’s Hetrick-Martin Institute which is HMI here in New York; I’m just thinking of examples. But I think as you build your business, I think you need to be giving back. And I think that’s seen as a commitment to the community that some people may not think about that’s important, or they may say if you’re resource constrained, you may say, ‘I don’t have the ability to do that.’ And I’m not just talking about monetary contributions. I’ve made a lot of time contributions to causes where I haven’t been able to write a check over many years, but I’ve always been giving back to the community because obviously I’m passionate about it. It makes me feel good but I think it’s also a way to give back that is not necessarily limited by my ability to write a check. So I will lead panels, I will put panels together, I will do webinars, I will help in whatever way- serve on boards, be on committees, et cetera. So that demonstrates that I am a part of the community, I believe in the community and I’m trying to build the capacity of the community. You know whether or not money is involved. So that’s important. I think the gender- paying attention to gender differences in the LGBT community is really important when you’re marketing your products and services thinking about the needs of lesbians versus gay men versus transgender members of the community, bisexual members and be really inclusive when you market or you speak about your services or you’re making connections, or you’re frankly educating yourself about how each of these- I would say sub-communities functions that they care about, et cetera. I know we’re all put together in the moniker of LGBT but I think there are really significant differences around this, and I really urge everybody to be cognizant of how inclusive we really are; because we need to walk the talk, we really need to be educated more than anybody else of course, about the diversity within the diversity. And so I’d say make sure that that’s on your radar screen, and for me back to my own personal example that might mean if I’m asked to lead a panel I will ask questions about what the- do we have a good gender representation, men and women. Can we involve a transgender person to be an expert? How can we ensure that a question is asked about different aspects of the community? So we really try to keep that on our radar screen. And similarly multi-cultural folks within the LGBT community and making sure that there’s diversity of ethnicity and background and there’s specific understanding about that, that community as well. So there’s a lot of, as I said, diversity within the diversity in the LGBT community and we often don’t have time to really drill down into that. But I would say anybody that’s doing business in that space does need to be cultural competent about that. Other advice. You know I think if you’re a smart marketer you know where the LGBT community is spending their money, where they’re passionate about. We go where the customers are and we try to be relevant with our products and services and be credible and gain trust. And I think these are some of the ways that you can demonstrate that you are supportive in a larger sense than just asking for the business. So Jenn I don’t know if that answers your question, or if you want me to elaborate in a different way on that; but those are just some thoughts that I had. No you totally hit the nail on the head and since you are the first interview in this series again, I think that what you’ve just outlined is a really core foundational piece of things. Of just really understanding the community and understanding that the community is not a monolith of everybody has the same views, opinions, thoughts on things. So I think that you’ve really just drilled down some really good advice for somebody who’s really new to this entire concept of marketing to the community. So thank you for that. My next question is specific to you, in the sense of being a member of the LGBT community, I know that you’ve been able to leverage that status in 100 different ways, but could you just give maybe one or two examples of how you’ve really been able to leverage your status as a lesbian business owner? Oh, sure I love that topic. Yeah, it’s really exciting. You know those of us who have been involved with the NGLCC efforts over a period of years, I mean I think we’ve been certified now for four or five years even. In fact we got certification before I got my woman owned certification. Has meant that we’re still part of a small community that’s growing and there’s an intimacy about it that has led to really what I would call, it’s a- I don’t even know what the word is. I mean we’re really dedicated to each other’s success and there’s a community that really wants to support each other. And the ways that that shows up is at the NGLCC Leadership and staff is constantly building the appetite for LGBT on businesses amongst their corporate sponsors which happen to be my customers for the business that I run. And meanwhile I’m trying to meet those people. So there’s enablement of connections there that happens around just generally might happen around a particular opportunity to bid on a piece of work that would be a fit for the skillset that we have. And then there’s a network of other suppliers that is just incredible. We help each other, we connect each other, we make our introductions to our mutual networks, and that’s been amazing for us to find vendors and suppliers even for JBC because of course we have spend as well, and we prefer to spend money with diverse suppliers to us. And so it’s a whole value cycle that continues. And so it’s just been incredible. I mean every event NGLCC does I try to be in attendance, I try to know who’s there, I try to meet the folks that might behoove me to know whether they’re a potential customer, potential partner. But the networking that I can do, especially amongst all of these companies who are likeminded, otherwise they really wouldn’t be there, is really inspiring. I mean it just feels like everyone wants to meet you. And I think what NGLCC has created is that kind of environment where they are driven to you as a supplier which feels good, we all know how hard sales can be when you’re trying to push onto somebody’s calendar, onto somebody’s radar screen, that isn’t really sure or doesn’t have an appetite for what you’re selling, and I think that the dynamic is much improved when it comes to the NGLCC and the kinds of events that they put together whether it’s matchmaking days that they hold, which are really cool. You have ten minutes with six or seven different companies who want to meet you, who want to understand more about what you do, who want you to follow up with them. And so we’ve had great success with that. And we’ve also- interestingly, I don’t know if I expected this but we are often one of the first, if not the first, identified LGBT owned supplier that many of these large companies have had the chance to work with. If we can get to the point where we sold a piece of work, we are often the first. Certainly the first in our category which is human capital consulting and HR-related services. But broader than that in some cases. So it’s been really neat to educate them along the way and serve as a role model and a guide to other LGBT-owned businesses that we might be able to refer in once we establish the relationship. And also our travel through that company, educating managers and executives and others that we may come into contact with about who are we at JBC, and how are we certified, what does that mean for the company, what does that mean for their overall business case for diversity; I know we were talking about before for sort of economic viability and educating along that. I think we’ve got a long way to go to spread that message and a lot of people that if you ask them, ‘What is supplier diversity and what is LGBT supplier diversity?’ that they really wouldn’t be able to answer. So that’s a huge, huge opportunity where I feel like we’ve just literally scratched the surface. So you’re pioneering through that space a great deal. Which is amazing. And you’re such a good representation of the LGBT community that I feel like there’s no better person to send into an organization to really explain to them the nuances of the LGBT community, and explain to them the impact that it does have on their business. I feel like you are the perfect person for that. I do love it. I mean you have to get to the matter of making money, but I do love the educational part. That’s a whole other podcast. Yeah. So I have one last question for you and then we will say goodbye. And that question is, what is the best piece of business advice that you’ve ever been given? Well I think it has to do with being a woman business owner as well and a woman generally, in addition to being a lesbian. I think the best advice was a friend who said to me, ‘Say yes and figure out how later.’ I really, I treasured it because I think as a woman we tend to get really obsessed with have you done this before? You know, what kind of credibility do you have? Do you have a track record? Are you prepared? We’re very perfectionistic about not wanting to take something on or say that we can do something without feeling confident that we can fulfill our commitment. And I obviously do fulfill my commitments and I don’t need to worry about that because I’m a responsible business person. But bigger than that, I think the ‘Say yes and figure out how later,’ was really opened a lot of doors for me that I built my business to think about; and consulting is very flexible, this may not be true for everybody who might be selling a product for example. But just that openness and that confidence that we need to manifest is so important, and especially critical for women and the women who are listening to this that we are more talented than we realize. We are more capable, and sometimes you are going to have to figure it out; especially as an entrepreneur and not having done it before. And trust that you’ll have the powerful network so you can gain the knowledge you need, can get the tools you need, you know who to call. But that you can say yes and you won’t figure it out. And it just- it seems small but it’s stuck with me. And I think that I would have said, ‘no’ many times along the way if I hadn’t been more bold and believed that somehow I’m resourceful enough to figure things out that may not be obvious. And wonderful things have resulted; some cases, in many cases from projects that I didn’t know how I would handle it, and how I would tackle it. And one thing led to another so I would just say it’s a confidence booster, it’s a principle that women need to exhibit much more of and that in some ways, take a page from how men have positioned themselves for a long time in terms of being able to do something and inspiring confidence, you know even if it’s not deserved. And if anybody, you want to read more about this concept you should absolutely read Lean In and get involved in all the conversations that are going on about what’s holding women back from success. But as an entrepreneur it’s just been a tremendous journey to educate myself about where am I holding myself back in terms of my beliefs about what’s possible. And my confidence and how I come across in the market. So I would give you that as one of many wonderful pieces of advice; but we’ll save those for other calls. Absolutely. So that is fabulous, thank you so much for talking with us today. And for anyone who wants to get in touch with you, how would you recommend they go about doing that? Absolutely. So we have our website which is www.JenniferBrownConsulting.com. I’m on Twitter and my handle is JenniferBrown- @JenniferBrown. And we have a LinkedIn presence as well and specifically we have a group called Diversity and Inclusion Leadership that you can look up and join and we actually run that group and we’ve got a growing- my goodness it’s growing, we have about 800 people on there right now. And everybody is sharing resources and articles and talking about diversity if you’re interested in that topic and there’s also entrepreneurs circles like LGBT entrepreneur groups on LinkedIn which we don’t administer, but which we are connected to. So I urge you all to join the conversation and to stay in touch with us in whatever way is convenient for you, and of course if you’re interested in our consulting services, whether that means having a speaker come in like myself talking to all sorts of different audiences; whether it’s young employees, executives, women, LGBT people, business leaders. Talking about everything we discussed today Jenn, I’m available for those and we also- obviously I’ve been talking about today do a lot of consulting work for organizations. So all of you that might be in a company that needs improving or is trying to restart or start initiatives having to do with leadership and diversity or Employee Resource Groups; we can absolutely be helpful to you. So please get in touch with us on our website at the info@JenniferBrownConsulting.com. email. That is perfect. Thank you again so much again, it has been great talking with you and we will stay in touch. Okay Jenn, thanks so much.